One of the difficulties of trying to write a weekly Colorado sports article is focusing on the biggest story of the week, and timing it within the deadline provided. Follow that up with the challenge of informing and entertaining the reader in 600 words or less, and the problem becomes compounded. Within the last ten days the Colorado Rockies had a playoff series, the Denver Broncos played twice, the CU Buffs traveled to USC, the Colorado Avalanche were five games into the start of the hockey season, while the Denver Nuggets were just hours from their NBA opener. And that’s just Colorado! Throw in the Yankees versus Boston, Mahomes versus Brady, Georgia versus LSU, McGregor vs Khabib, our Fantasy Football teams, and everything else, and where does one even begin? Fortunately, in the world of social media and millennials, where 600 words is like a Tolstoy novel, I’ve decided to cover all of it, so we can all get back to the important stuff, like texting, and Fortnite. The Rockies were bounced from the Playoffs after being swept by the Milwaukee Brewers. Great season with back-to-back playoff appearances, but after hitting .174 as a team in the playoffs, including .146 against the Brew Crew, the ending was hard to watch. Too bad Kyle Freeland never got a chance to pitch, and too bad Nolan Arenado failed to show up. Losing to the Los Angeles Rams was predictable. But being embarrassed by the New York Jets the week before was a potential coach killer. 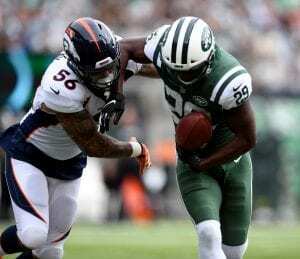 The Jets rushed for over 300 yards including 219 by Isaiah Crowell, and 99 yards by back-up Bilal Powell. The Broncos followed that up by allowing 208 yards rushing to Todd Gurley. The close loss to the Rams may have been a moral victory, but moral victories don’t count in the standings. The Buffs lose to USC. While the streak is snapped at five, I still like this Buffalo team. Laviska Shenault Jr. proved he can play against anybody, Steven Montez played a decent game, and the Buffs still are only one win away from a bowl game. Apparently, Nebraska is no longer the old Nebraska, UCLA is no longer the old UCLA, but USC is still kind of USC. The Colorado Avalanche are 3-1-1 after an OT loss to Calgary. Nathan MacKinnon already has six goals, and Mikko Rantanen has seven assists. Wait! When did the NHL start up again? I’ve watched 200 different games over two dozen channels over the past ten days. I think I would’ve noticed. The Denver Nuggets tip off their season tomorrow night against the Los Angeles Clippers, although there isn’t much to update. It’s basically the same squad, except they’ve added Isaiah Thomas and Michael Porter Jr., who both probably won’t be back for a month or two. The Nuggets have a good shot at the playoffs after just missing out last year, but with LeBron in LA, Carmelo in Houston, Boogie Cousins with the Warriors, and Jimmy Butler who-knows-where, it may be easier to find the Rapids on television rather than the Nuggets. More college football as CSU topped New Mexico, and Air Force lost a tight one to San Diego State. Finally, the Colorado Rapids defeated the Minnesota United FC on Saturday, 2-0, for just their second road win of the season. To be honest, I didn’t even know that Minnesota had a professional soccer club. I barely knew Colorado did, but I promised an update in 600 words or less and had about another 50 to spare.